As part of DBA’s involvement with a combustion program, a need had arisen for high temperature precision valves. 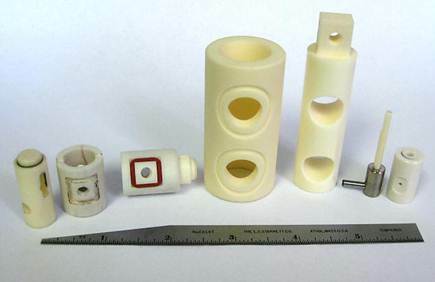 The primary challenges included temperatures and pressure in the combustion range, near zero leakage, varying actuation methods and overall packaging configuration. 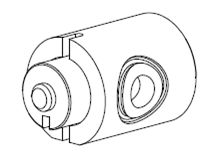 Through many iterations of geometry and an exhaustive supplier search, DBA developed a piston/cylinder spool valve with a diametrical clearance of 50 – 80 μin. Operating conditions were as high as 973ºK and 200 bars. After an extensive study, ceramic was identified as the material of choice. With the help of an industrial partner, DBA was able to use the critical manufacturing process of machining customize features in the green state while finishing the sealing surfaces in the fired condition. A low sliding force moves the piston axially, and the addition of stem accessories allows the valve to be alternatively operated with rotary motion in other applications.